This one of a kind luxury motor coach lot must be seen in person to be fully appreciated. 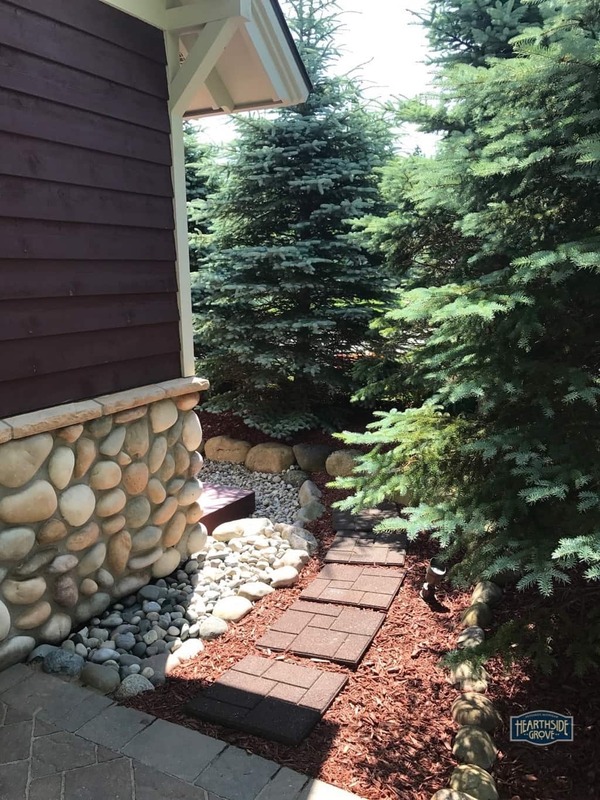 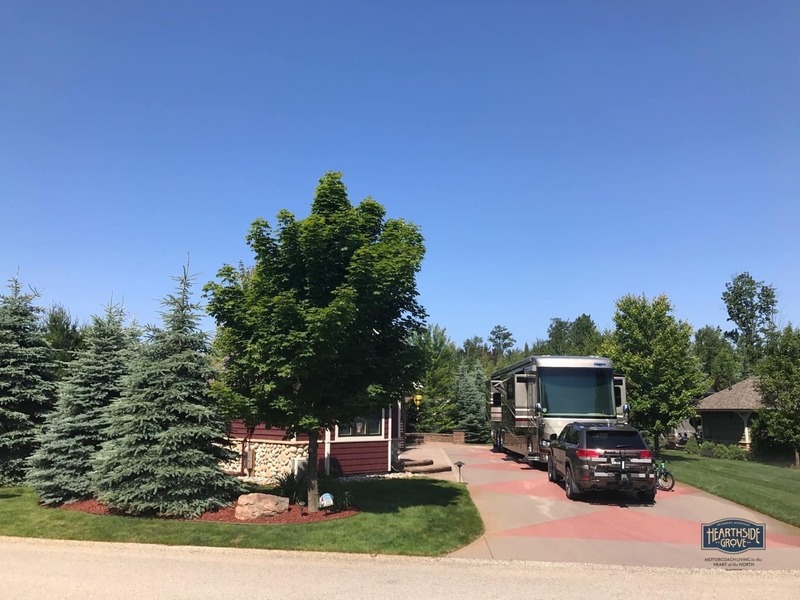 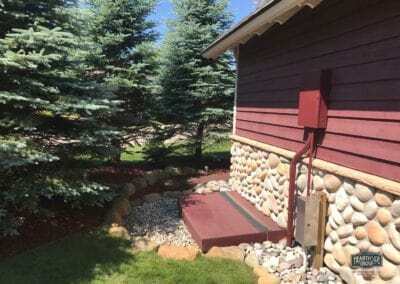 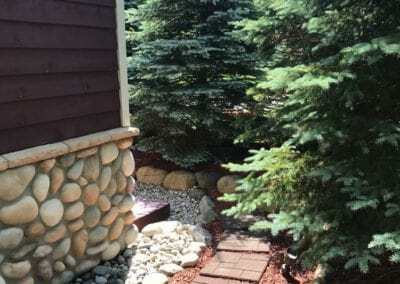 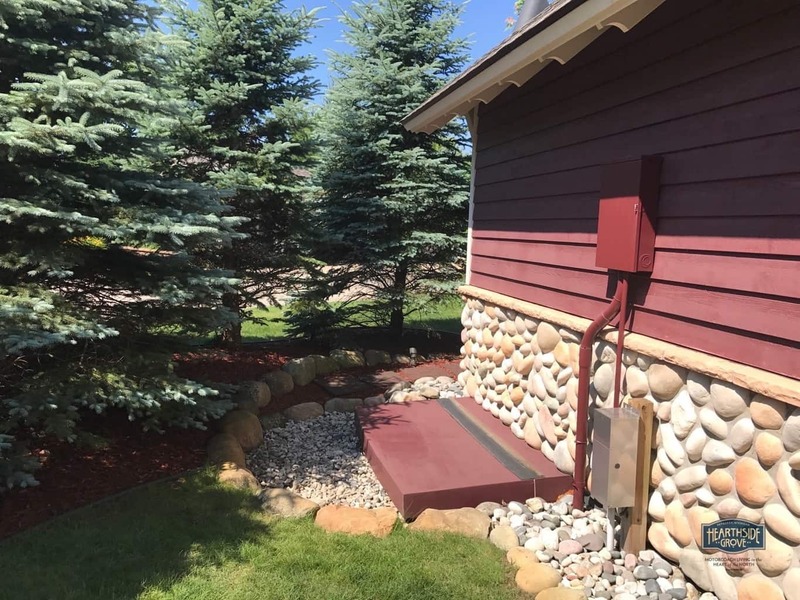 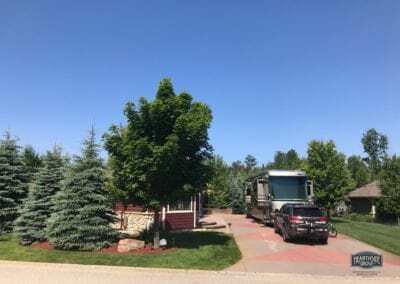 A back-in lot that is like new and move in ready, buffered with mature and accent landscaping on three sides, offering privacy from the road and neighboring lots and a natural setting to be enjoying all day. 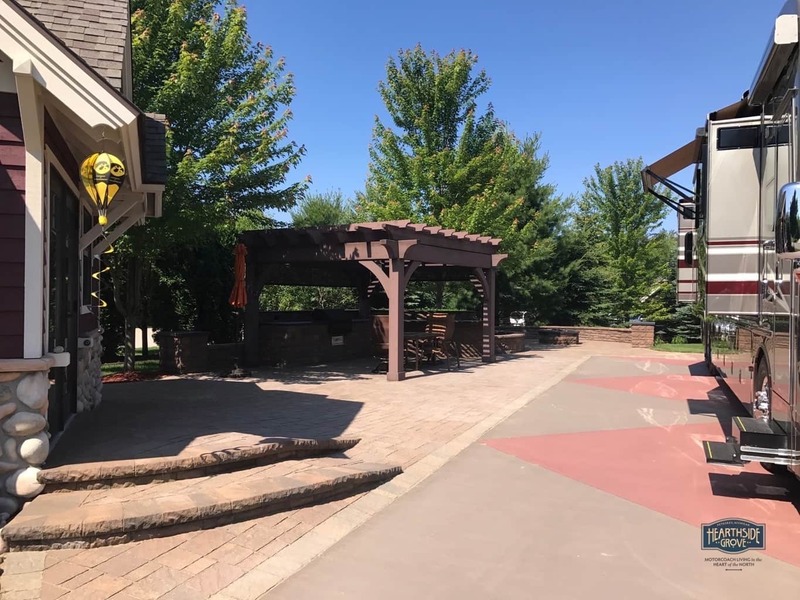 Find yourself pleasantly at home on lot 321 featuring a large brick patio, 60′ brick seat wall, oversized custom pergola w/privacy sun shades and summer kitchen covered with granite countertop and featuring an American outdoor BBQ grill. 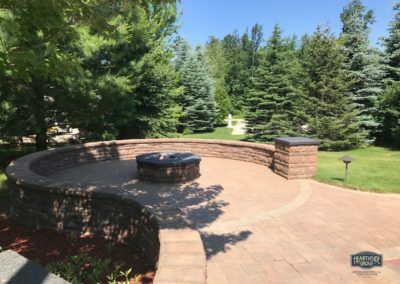 At the rear of the lot you will find a large circular patio with seat wall and natural gas fire pit providing plenty of space to enjoy with family and friends. 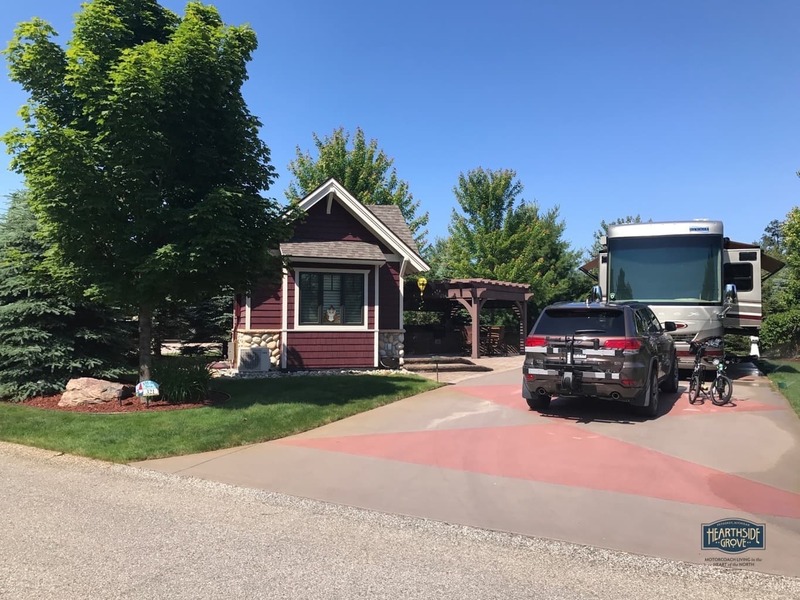 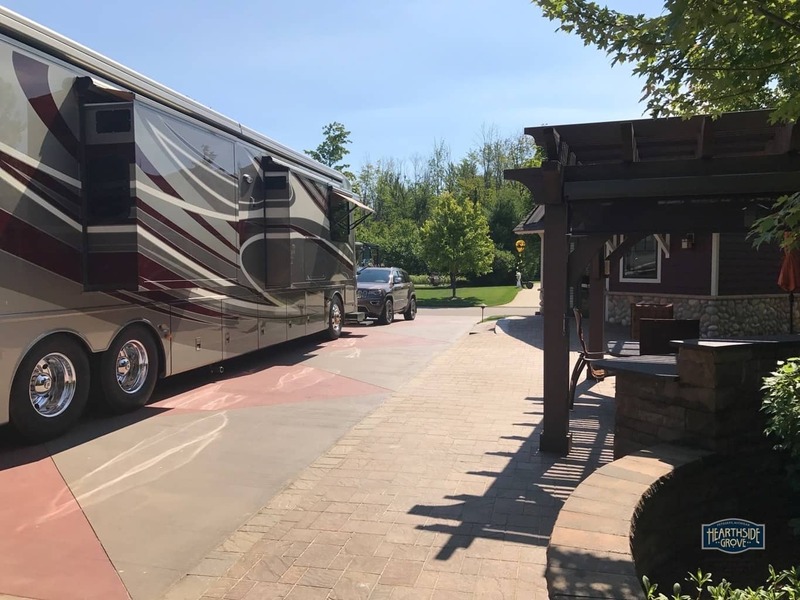 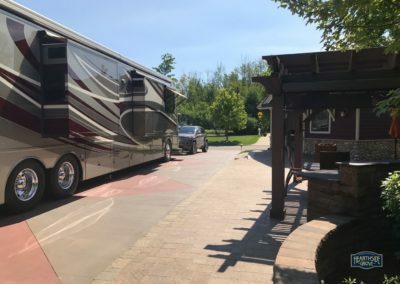 An extended painted drive for the coach and tow vehicle to comfortably rest with a additional 6′ of brick pavers behind the drive to store your bicycles, motorcycle or simply access the opposite side of the coach. 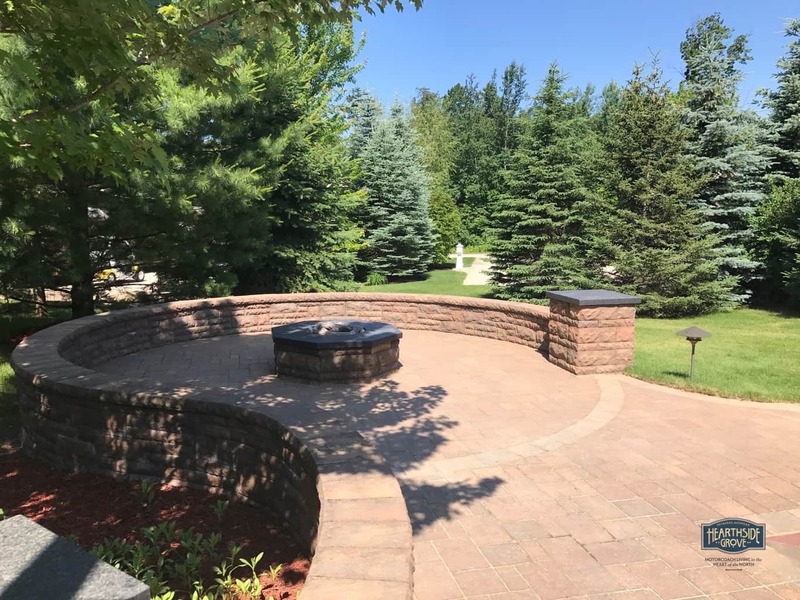 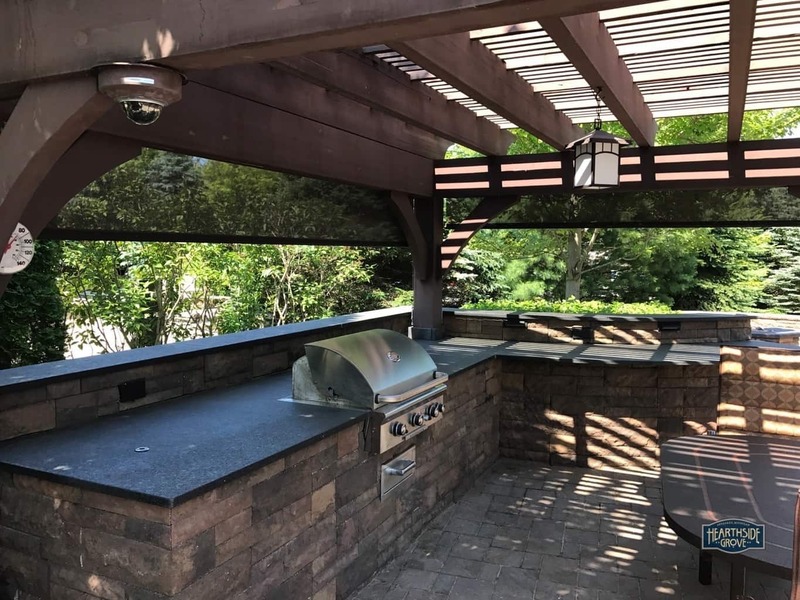 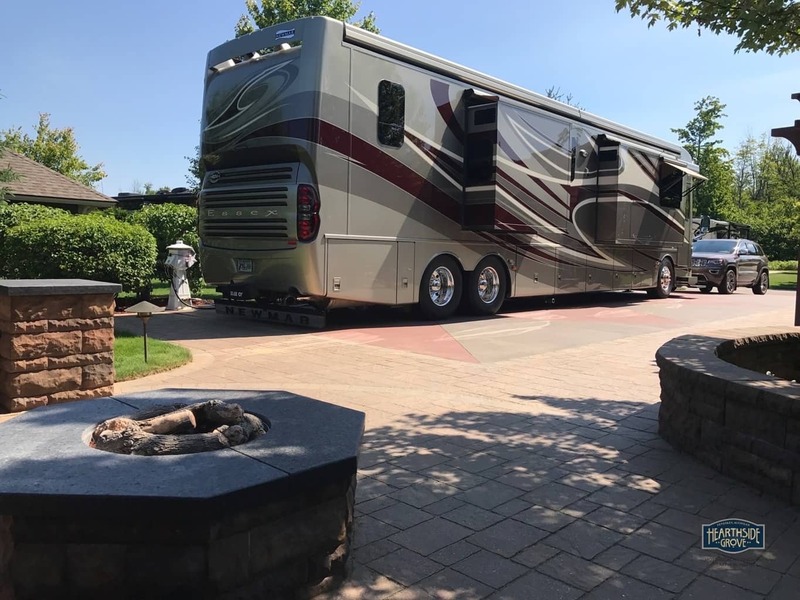 Behind the drive and fire pit patio is a large lush grassy space for your four legged family members or those visiting grand children to play. 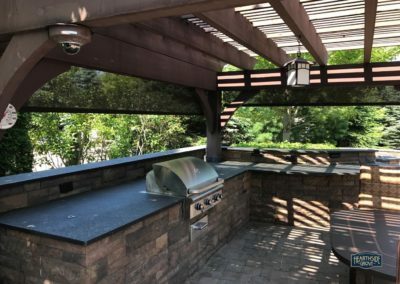 The exterior of this mint condition property can be enjoyed all day long. 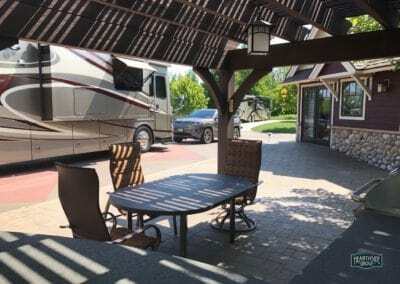 Relax in the morning as the sun rises on another beautiful day at the well maintained patio furniture set with a local paper and cup of coffee. 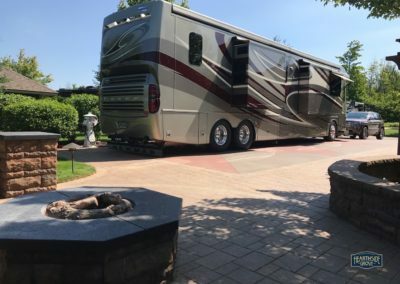 Lounge in the evening around the warmth of the fire feature and enjoy the glow of the outdoor accent lighting. 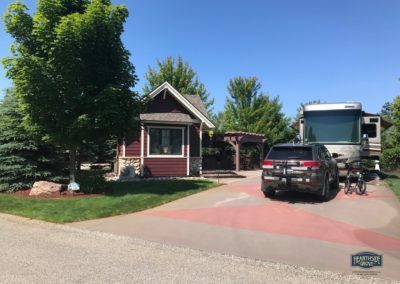 Even when you are away from the resort you can see what is happening with the professionally installed outdoor grade 360 degree security camera offering live and recorded video/images. 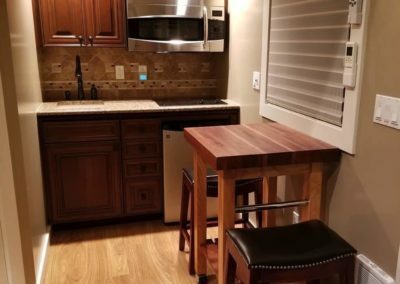 The main level of the gable bungalow offers a functional and open space complete with kitchen, bath and loft. 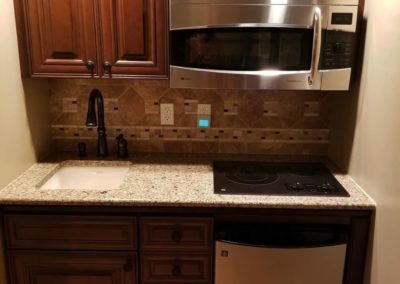 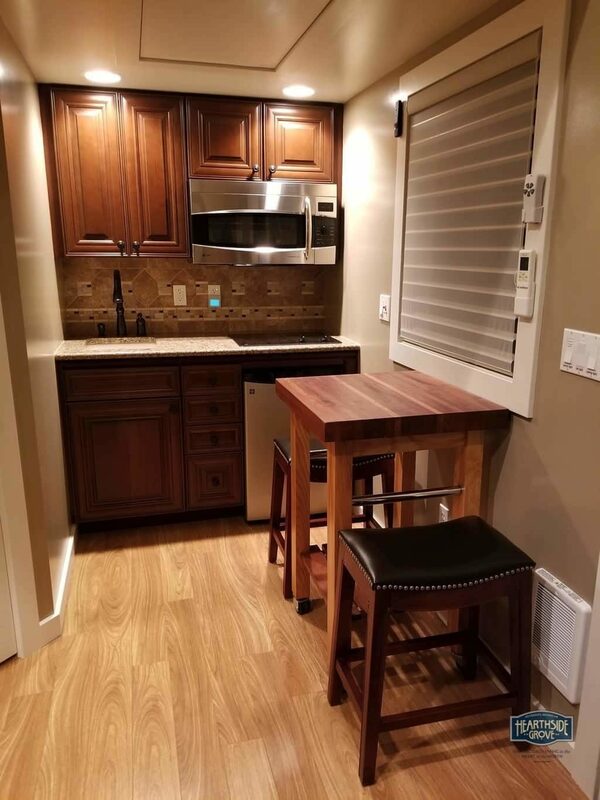 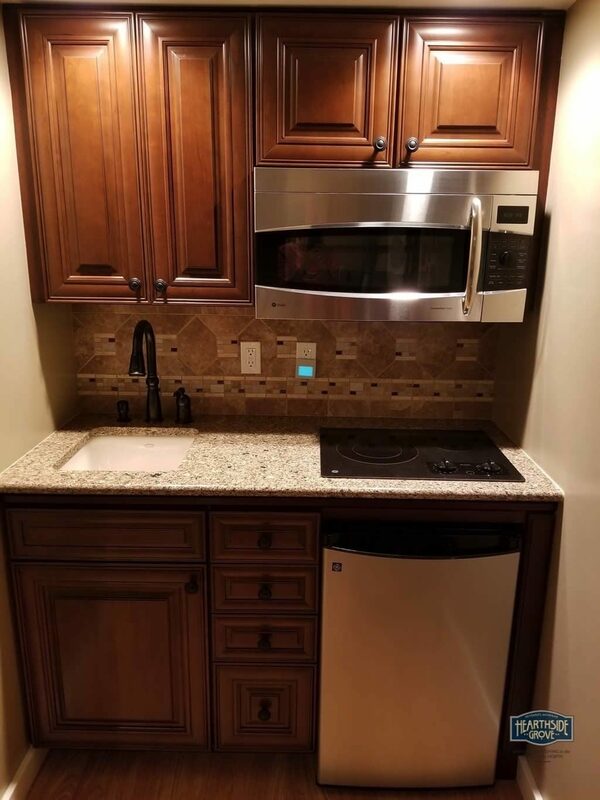 The kitchen space offers solid surface countertop, ceramic tile backsplash, plenty of cherry cabinetry storage above and below, Kohler sink w/Delta faucet, GE convection/microwave combo, GE two burner cooktop and GE mini refrigerator. 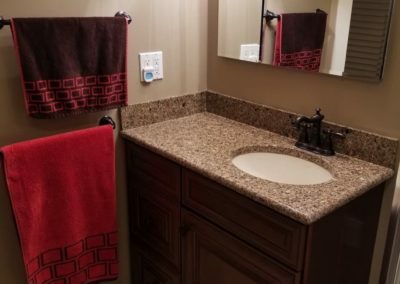 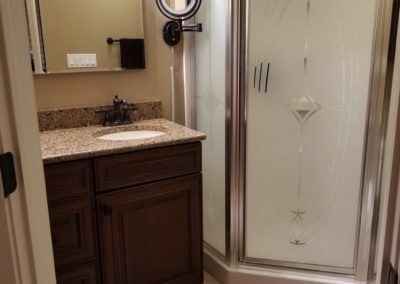 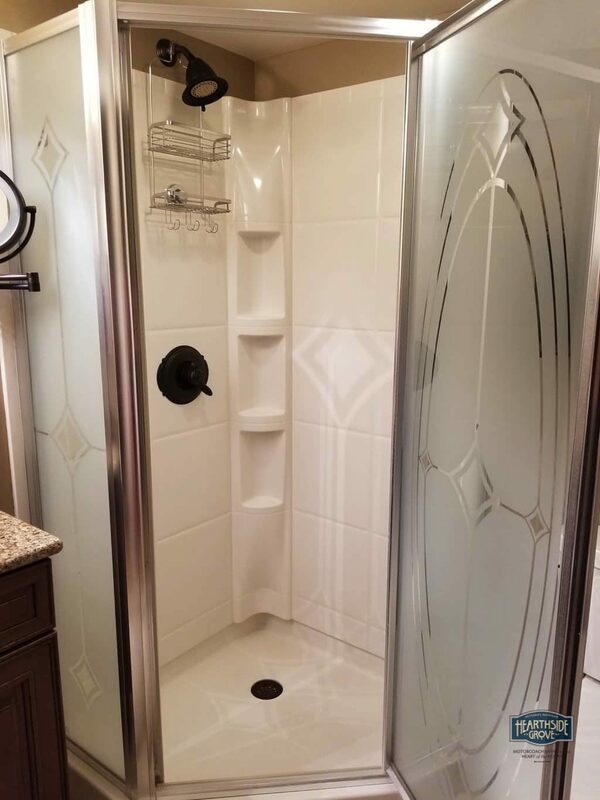 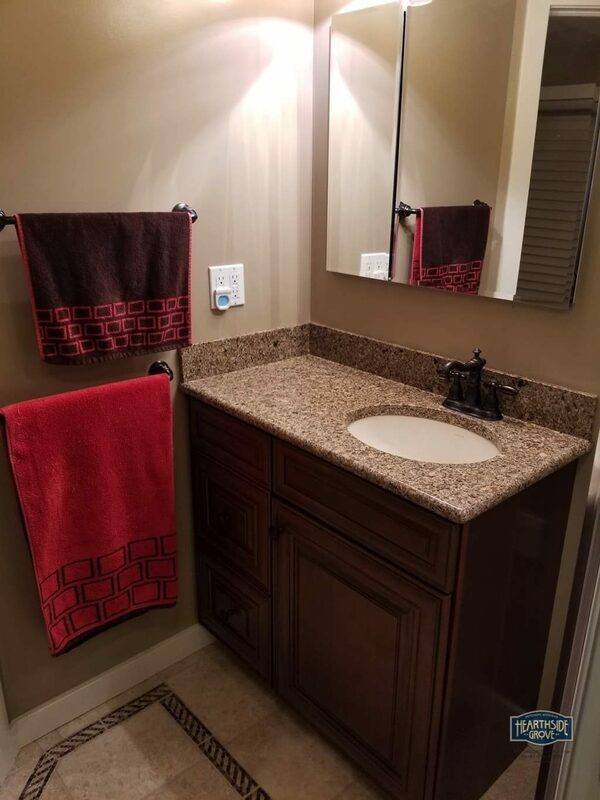 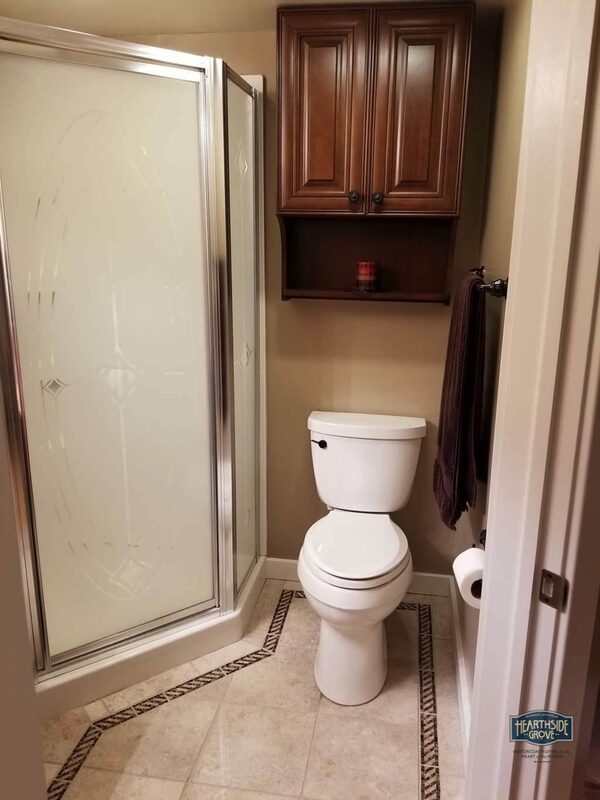 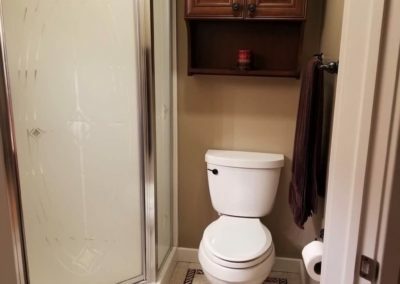 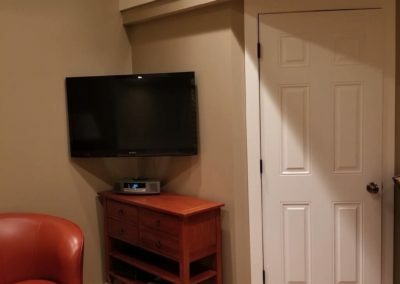 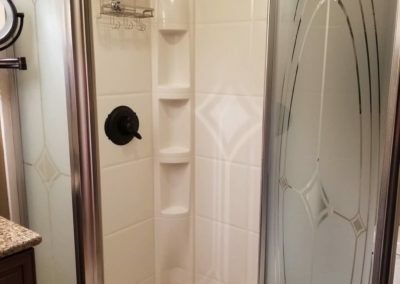 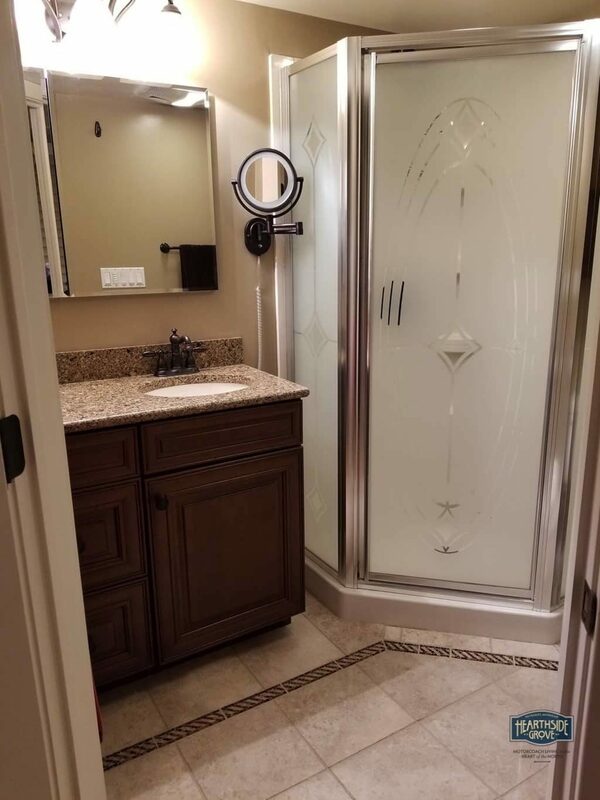 The bathroom offers ceramic polished marble floors, Kohler sink, mirrored recessed medicine cabinet and toilet, walk-in shower stall, wall mounted lighted magnified mirror and solid core entry door. 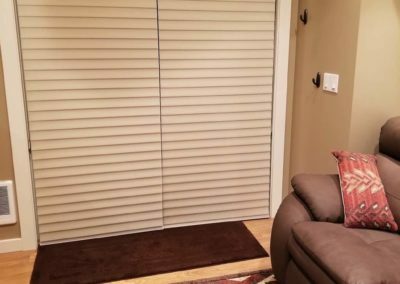 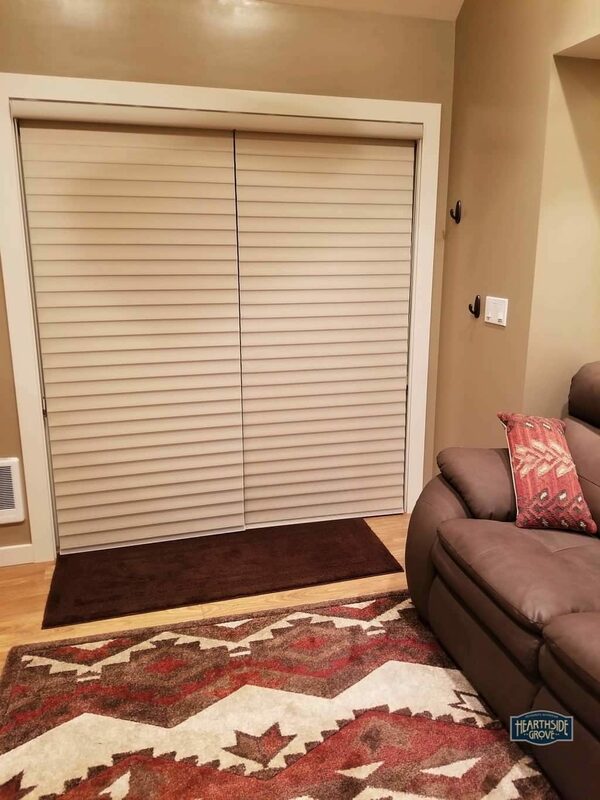 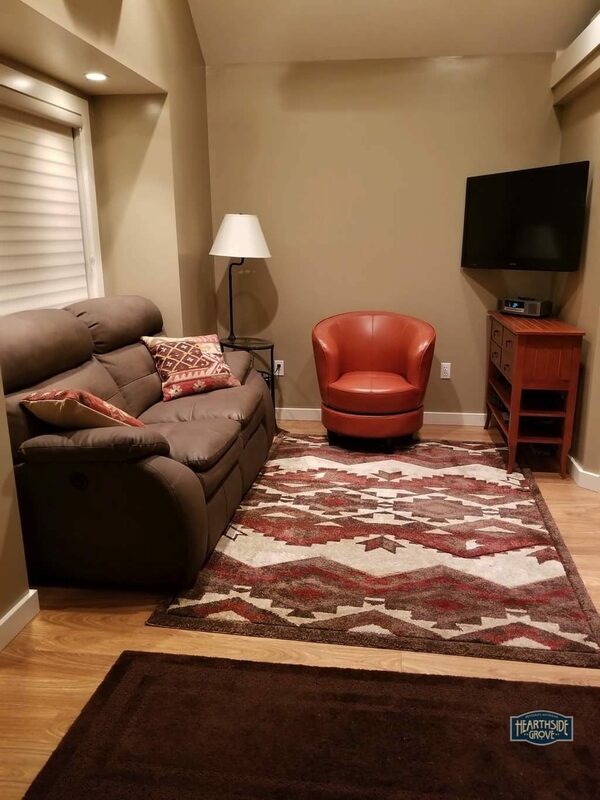 Back in the main space the Gable style bungalow features a pergo prestige flooring, Hunter Douglas shades(windows and french doors), A/C and Heater unit, ceiling fan and light combo w/remote, recessed lighting, 40″ Sony flat screen TV and blue-ray player. 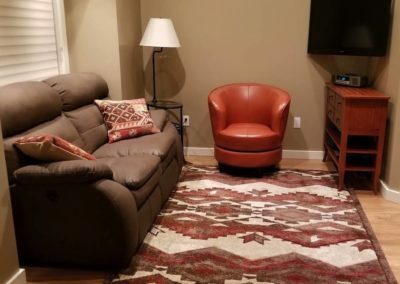 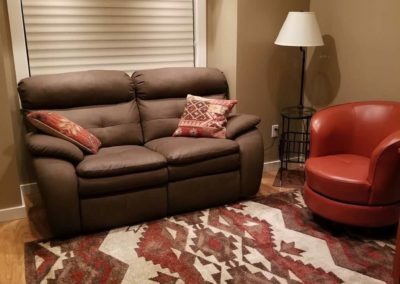 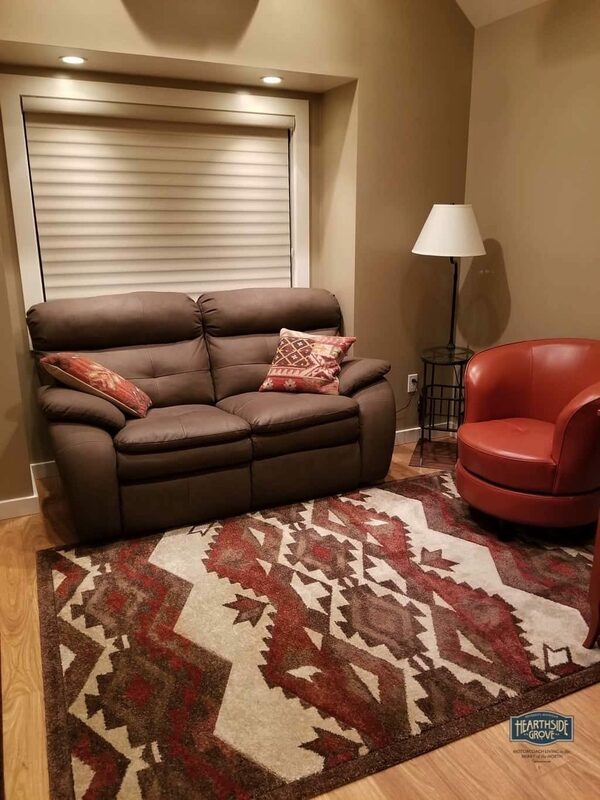 Also included are a power reclining love seat, swivel upright chair, large rug w/pad and a one-piece glass end table w/reading lamp. 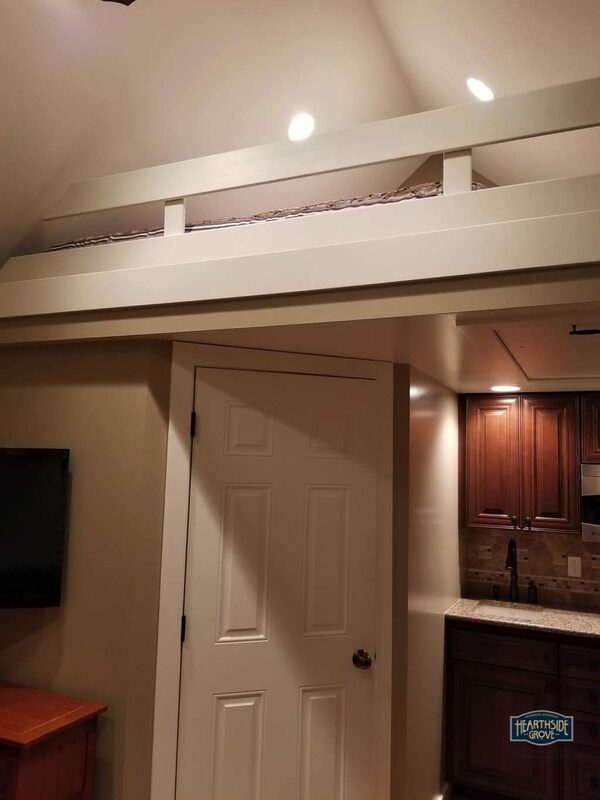 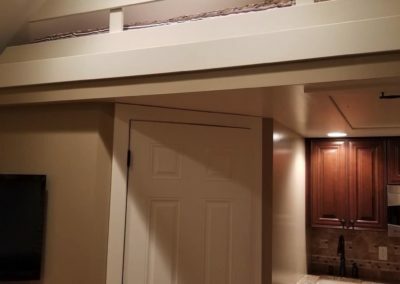 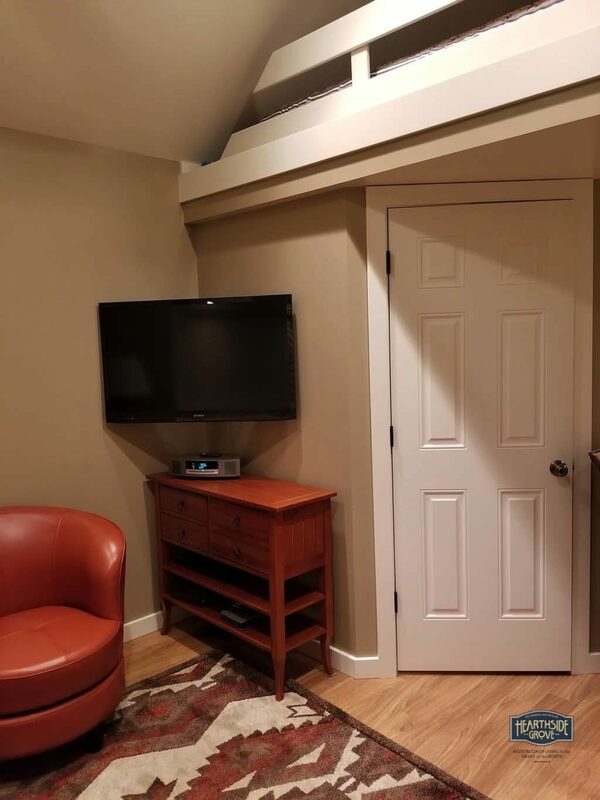 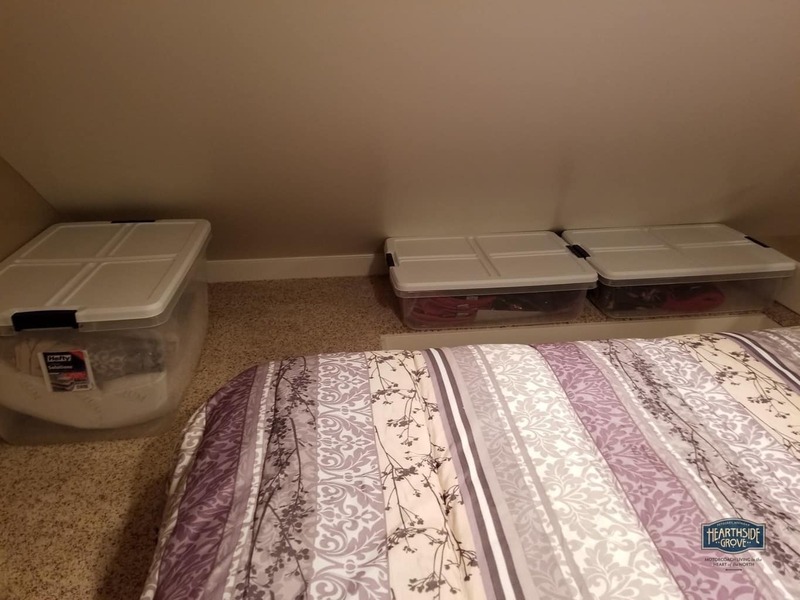 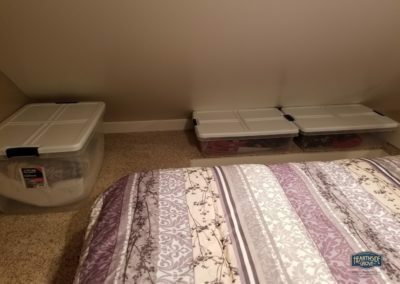 Access the carpeted loft by pulling down the folding ladder from the ceiling offering a comfortable space great for additional storage or a mattress for the occasional guest.